At least we agree here. I mean you jumped into a reply I made to a different user, got angry real quick. Said the exact same thing that he said. Attempted to provide "evidence" with a link to another thread that didn't contain any evidence and then fell back on the making BS assumptions on my opinion on Trump/Hillary. I mean you literally brought up "but but hillary" after I asked another user for his evidence, because I'd genuinely like to see it. Reevaluate where you are heading with this mentality. Do you understand how forums work? This isn’t a private conversation between you two. 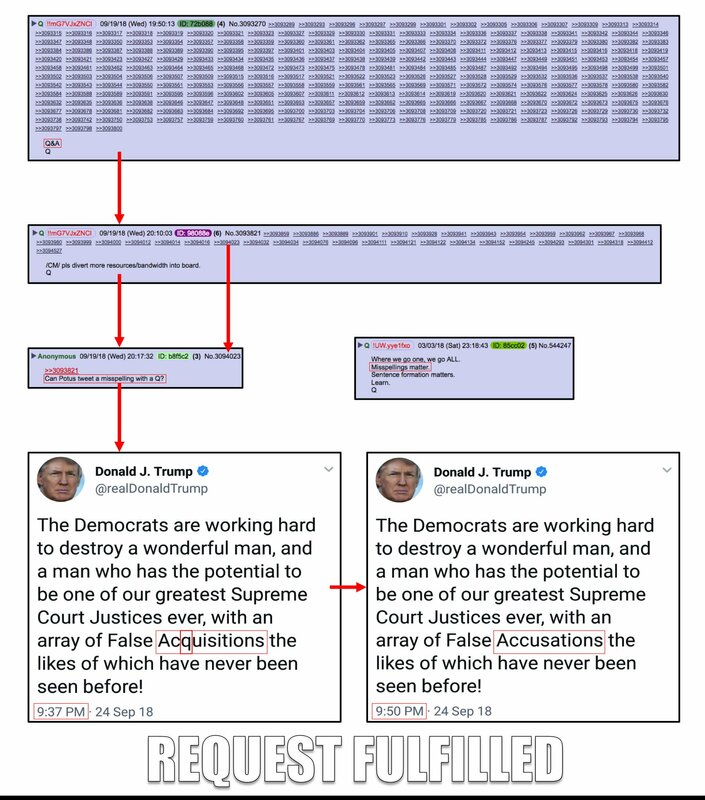 You asked for Q proofs. I provided you with a long list of Q proofs. Apparently those weren’t the specific Q proofs you were looking for. The thing you don’t seem to get is that we are so far beyond proving Qs legitimacy that it’s silly. Mockingbird is real and being taken down as we speak. No I didn't. I asked for two specific proofs that 3n19m470. From 3n19m470. Instead you've thrown a fit about it and decided to post the first google link from searching "Q Proof". Now either go back and respond to what I actually posted, or tuck your tail and be quiet and i'll wait for 3n19m470 to provide the evidence on his two claims. Ok tough guy. Guess I’ll just be quiet now. You sure put me in my place. I think I’ll go to my safe space and have a nice cry about it. Now this is one I had seen and does add weight. Although its five days later and Trump deleted it, its close. Also interesting as Trump doesn't usually delete his misspelt tweets, AFAIK. Hoping 3n19m470 has the 8 minutes one he claimed as that would be much better proof. If Sandmann wins his $250 million suit against CNN, all of us can do a "class action" to have CNN shut-down.